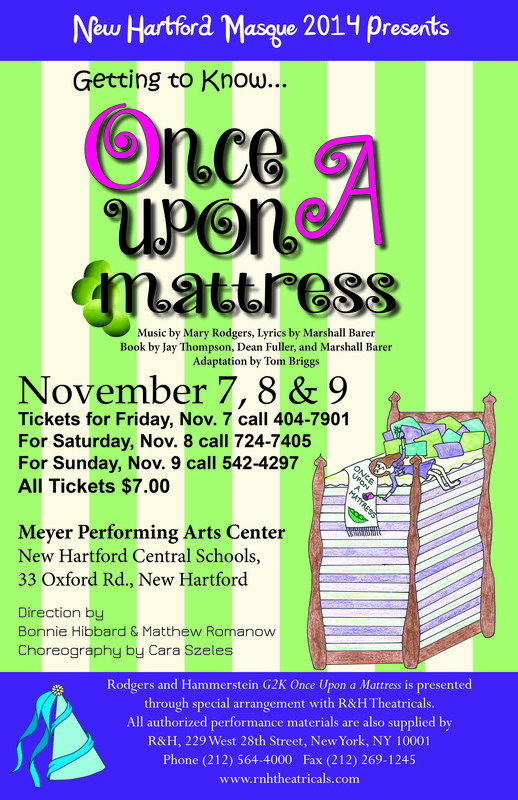 If you’re in the greater Utica area and have an hour to spare this afternoon, I highly recommend you stop over to New Hartford HS for the Jr. High production of Once Upon a Mattress. Ashley Pope effortlessly holds the stage and everyone’s attention with a gently goofy take on Princess Winnifred that channels Carol Burnett and a bygone era of unironic comediennes. Her performance is one of those rare “aha” moments that makes enduring dozens of duds worthwhile. I enjoyed every moment she was on stage; the fact that she also seemed to be enjoying herself, and not at the audience’s expense, certainly added to our delight. In particular, she has a great time with the musical number Shy, throwing herself and her voice around to great comic effect. Habeeb El-amir is a terrific foil, looking completely smitten (he’s the audience surrogate) and always game for a pratfall. He never upstages Ashley, instead putting her on a pedestal and committing entirely to his bits – he doesn’t just fall, he slides face-first across the stage (it’s kind of amazing.) Ashley get close to brilliance in the scene where she’s given a sleeping potion and increasingly loses control of her limbs and her voice; she tops that when she finally gets on the titular mattress and can’t fall asleep. Her spasms were increasingly inventive, the kind of physical humor that can’t be taught – you either have the instincts and the timing or you don’t. Seriously, see Ashley Pope in this. It’s a cliche to say “a star is born,” but sometimes, very rarely, that’s exactly what happens.